Modifications: Intellect defense as level 5. 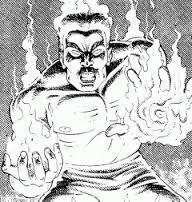 Combat: Burster's are pyrokinetics who can deal out damage against friend and foe alike, very quickly. Use: A burster is the leader of a gang of mutants who has been preying on a major trade route. Tracking the bandits and protecting the trade route has been difficult, because the burster's flair for destruction. Loot: A dead burster yields 1 cypher.